I decided to take this picture of our dogwood tree from our bedroom window this morning before the snow zapped the blooms. I'm glad I did because the snow has arrived. Hope my hostas and all my other flowering plants come out it and aren't destroyed. Where do you live Catherine? We had snow a couple of days ago but today was plus 16C, the leaves haven't come out yet but some of the plants are started to come out. I live in S.E. Saskatchewan. Hope all your plants survive, I am feeling your pain! Oh I hope that the snow doesn't show up! It would be a shame to lose those beautiful blossoms prematurely. Our weather is beautiful right now...a high weather system circling back on us from New Brunswick. Hope that this nasty stuff doesn't make it here. Yikes! 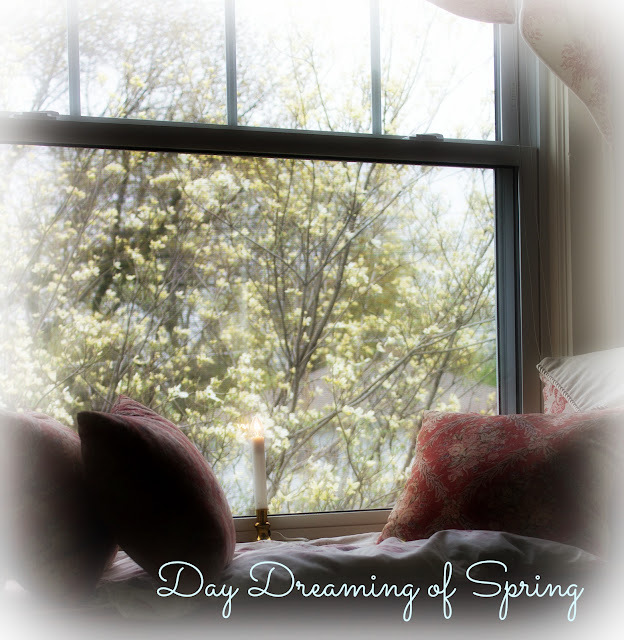 I hope we are not just dreaming of spring, and it does actually show up , and our blossoms are not destroyed.